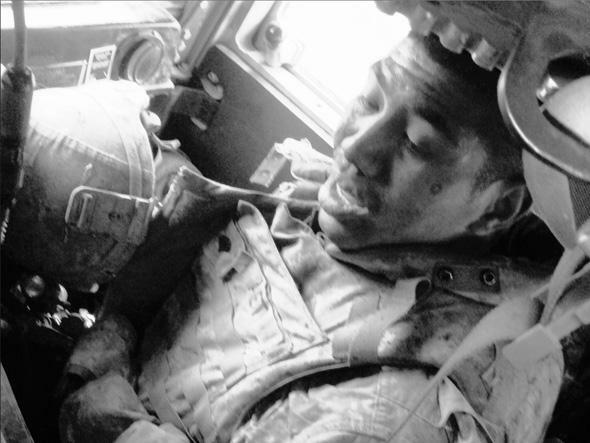 Veterans Day and PTSD: One soldier faces his mental health issues after returning from Iraq. One soldier’s trip through the Army’s post-traumatic stress program. Excerpted from Thank You for Your Service by David Finkel, published by Sarah Crichton Books. “I don’t know if everyone knows your story, but you all are fortunate—because this is a hero,” a woman is saying about Tausolo Aieti. The woman, a psychologist, is standing with Tausolo in front of a few dozen people, all on folding chairs that have been set up in a little out-of-the-way room at the Topeka, Kan., Veterans Affairs hospital. She is smiling, and when she turns to Tausolo and says, “You define what a hero is,” he resists the urge to turn away. This is progress. He knows it. When he was admitted seven weeks ago to Topeka’s inpatient PTSD program, he couldn’t look anyone in the eye. Now, on his graduation day, the only one he can’t look in the eye is himself. Three other men are graduating with him, all of them old Vietnam guys still trying to recover 40 years later. One has the collapsed face of a drunk used to sleeping it off in the sun, and another has the posture of a man who lived for a time under a bridge. “Thank you ever so much,” one of them says to the hospital workers, family members, and the program’s 20 other patients gathered in this room. “I look at myself in the mirror each morning and tell myself, ‘You’re worth something.’ ”Another stands with his wife, who says they’ve been married 40 years and for 30 of them he’s been ill, so she’ll see. Tausolo is the youngest by far, the only one of the four still in the Army, and the one whose wife has decided not to come. He is 26 and from American Samoa, and the stunned look on his face this day is the same as it was on the sunny afternoon that he was covered in soot and blood and he asked another soldier if Pfc. James Jacob Harrelson was OK. Here is Building Two, second floor, mental health. Here is where no one knows he is. Or almost no one. His wife, Theresa, knows. The dream comes every few nights. He never dreams about the soldiers he did save, only about Harrelson, and only in that way. For a while, he could handle it, and then one day he couldn’t. Home now, and it’s just as he had left it seven weeks before. The walls are gouged from him throwing whatever he could get his hands on. The bedroom door has a fist-shaped hole all the way through it. At least Theresa is no longer cowering, but she is looking at him with her own version of a stunned expression, one that tells Tausolo she is wondering what will happen next. The place they live is Grandview Plaza, a speck of American landscape along the interstate between Junction City and Fort Riley in Kansas. It’s a town of low houses and tall pickup trucks, a towering billboard that says “Obama is a Fraud. Demand Resignation Now. God Bless America!” and Geary Estates, a 372-unit apartment complex that is filled with military families and where there have been two recent suicides. One was a soldier who had just returned from the war. One had yet to go. One very courteously tried not to make a mess, placing a folded sheet on his mattress and his Army jacket on top of the sheet and then lying down on top of the jacket before shooting himself. The other shot himself, too, but abruptly against a wall. “I call it Bloody November,” says the apartment manager who scrubbed down the walls with bleach and primed them for repainting with a stain-blocking product called KILZ and used office scissors to cut out the sections of ruined carpet and wished the whole time that the county required that such things be done by a hazmat team. Two weeks after the second suicide, Tausolo and Theresa moved in. It wasn’t one of those units, but it was only a few doors away from one of them. They didn’t have much: a mattress and box spring in the bedroom, a dining room table, a couple of couches in the living room. Their extravagances were a big TV and some framed family photographs on the walls, and the photographs were what Tausolo reached for first when he once again woke up from seeing Harrelson, finally broke down, and began throwing whatever he could get his hands on. He spent a week locked down in a hospital, then tried an outpatient program in Junction City he didn’t like, and then was admitted to Topeka. For the seven weeks he was there, Theresa was on her own in the apartment, just her, the gouged walls, and the punched-in door. Like Tausolo, she had grown up in American Samoa. She had come to Kansas uncertainly, helped a little by the fact that her sister, who was also married to a soldier, had ended up here, too. Now, four months pregnant, she began going to her sister’s more often, sitting for hours outside in the sunshine and hoping the summer heat would burn away her growing doubts. “Deep down, he’s scared of something. But he doesn’t want to talk about it, so he does stuff,” she said on the day before his return, trying to imagine how he would be when he came home by remembering how he had once been. “When I first met him, he was never like that,” she said, but then he deployed, and one day he called and mentioned that he had hurt his leg, and then he was back home, waking up every few nights from a dream he would only say was about the war. He began to take sleeping pills to fall asleep and another kind of pill to get back to sleep when he woke up. He took other pills, too, some for pain, others for anxiety. He began to drink so much vodka that his skin smelled of it, and then he started mentioning suicide. Maybe this is what happens to soldiers, she had been thinking. Growing up, she’d been aware that a lot of Samoans joined the military, including in her own family, all of whom seemed the same as ever when they came home. But now she was learning otherwise. A few months before, a Samoan she knew a little bit, one tour in Iraq, diagnosed with PTSD, had hanged himself in his barracks in Hawaii. And according to her sister, her brother-in-law was having difficulties recovering from his tour in Iraq, which had caught her off guard because as far as she could tell he seemed as happy as ever. Still—suicide? Tausolo? “I don’t know if he’s serious because before this he was never serious. My husband, he would joke about everything. Yeah. So. Suicide,” she said, holding her stomach as the baby growing inside her kicked. She stayed in the sun until it was time to go back to Geary Estates, and now, the next day, here he is, home, the hero, showing her his certificate. In this one regard, Tausolo is fortunate. Jay Howell has a reputation of looking after his soldiers. But a nurse case manager is now looking after Tausolo, too. She wants him to transfer into another unit called a Warrior Transition Unit. It’s for soldiers who are injured, some physically, most mentally, a unit where a soldier is excused from the daily duties of a healthy soldier and is treated instead as a long-term, recovering patient. “The WTU?” Howell asks, surprised. “Yeah,” Tausolo says, and after some silence, Howell asks him what he wants to do after the WTU. “I want to see if I can come back here,” Tausolo says. Tausolo knows what he’s saying. He pauses, thinking about the stuff. Cajimat burned to death, too, strapped in his seat, just like Harrelson. “You need to get away from that stuff,” he says after a moment. “It’d be a fresh start,” Howell says. Tausolo gets up, goes out, feels those crawling eyes. How much do they know? It doesn’t matter. He’s not one of them anymore. Correction, Nov. 12, 2013: This article’s photo caption originally stated that the image depicted Tausolo Aieti in his Humvee moments after the explosion. The photo shows Aieti in another Humvee after the explosion.